This is the seventh day in my Israel diary, where I’m attending the HP Indigo VIP Event in Tel Aviv. See Day 1 in Tel Aviv here, Day 2 in Jerusalem and Bethlehem here, Day 3 at the HP Indigo offices in Nes-Ziona here, Day 4 at Pageflex and Caesarea here, Day 5 at the HP Indigo Plant in Kiryat Gat here, and Day 6 here. 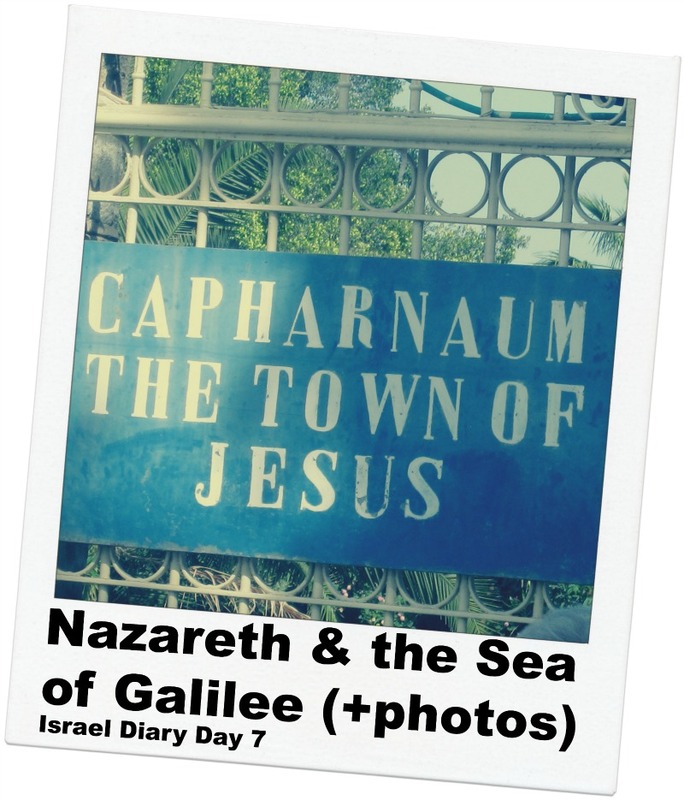 Today, HP has arranged for two tour options: Jerusalem, or Nazareth and the Sea of Galilee. Since I’ve already visited Jerusalem, and given that President Obama is said to be tying up significant amounts of the city and corresponding traffic, I decide to head to Nazareth and Galilee. A fantastic tour guide leads our bus, and two Vision staff members join us for the day. Vision is the company that HP used to facilitate the HP Indigo event. Yonatan is our 24-year old security detail, and is tall (probably 6’3″), and armed with a pistol stuck in his pants. Initially, it is a little jarring seeing a pistol lazily hanging around, but I end up getting used to it. In addition, a 24-year old girl (whose name escapes me) also joins us, and while her English is less proficient than Yonatan’s, she ends up providing remarkable insights into Israeli life. Her stories of her youth in Tel Aviv during tense times were captivating, and she described how she and her older sister were terrified of visiting certain areas because of bus bombings, and other terrorist activities. At present, she lives in a kibbutz, which I naturally peppered her with questions about. She is a gracious host and very helpful. Our first stop is Nazareth, where we visit the cave Mary is said to have lived when the angel appeared to announce the good news. Like other historic areas within Israel, a church has been built over the location, and the structure reveals evidence of multiple buildings erected over the centuries. In addition, we visit locations that Jesus is said to have lived with his family. Unreal! Next, we visit Capernum, where Jesus began his ministry. It looks kind of like Pismo Beach, and it is (again) difficult for me to reconcile the Gospels with the locations I’m seeing. After that, we make our way to the Sea of Galilee, including the location of the Sermon of the Mount, and the spot where Jesus multiplied the bread and fish. I try to imagine thousands of people sitting on the hillside, which isn’t difficult to do given the incredible view and spectacular weather. The area is strikingly beautiful, with a shimmering Sea of Galilee surrounded by a beautiful coast. I must say, Jesus picked a beautiful place to intersect time and space; I suppose if the Jews had been in Laguna Beach 2,000 years ago, he may very well have appeared there! In addition, we visit the Jordan River, where John The Baptist baptized Jesus. The spot is crowed with numerous people getting baptized and dipping into the Jordan, which is blue-green in color. From one end of the shore to the other is probably no more than 40 feet, and I’m surprised by how normal it looks. We get back to the hotel around 6:30, and I make plans to have dinner with Frank and Owen. Owen runs MOR Printing, and was a lot of fun to hang out with on the bus and our sightseeing stops. We take a 10-minute walk towards Jaffa, and eat at an incredible place recommended by Frank. The restaurant sits in what used to be a rail station, and fortunately we are there early enough to be quickly seated. It stinks that I have to eat so quickly, but I’m scheduled to be picked up at 9:00 to head to the airport. It is hard to believe that my time in Israel is drawing to a close, but it’s been filled with incredible memories, the start of new friendships, and a deep urge to return. I’m struck by how my worldview has been expanded, how many incredible conversations I’ve had (with people at airports, planes, and other places around Israel), and how my eyes continue to see new beauty in humanity, and the delicate (yet) common threads that connect us all. I’m struck by the intriguing people I’ve met, who each have their own aspirations, hopes for the future, love for their family, and understanding of why we are here, and what life means to them. I’m thankful for the opportunity to have visited Israel, and for the hospitality shown me by so many, including strangers. As I’ve already said, I certainly intend to return, and if you ask me, it can’t be soon enough! Here are some pictures from the day. Click to enjoy! My first view of Nazareth. This area remains me a bit of Tunisia. We stopped for lunch on the way to Galilee. Hungry! This is the spot where Jesus multiple the fish and bread. Wow! This alien-looking complex sits over the ruins of Peter’s house; this location is near the Sea of Galilee. Another shot of the Sea of Galilee. Beautiful!